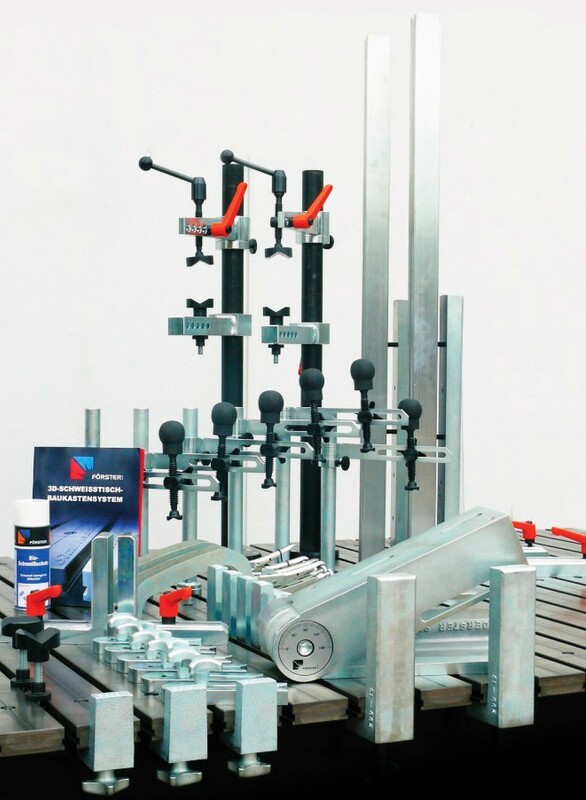 This equipment set from Forster America comes with all of the tools needed for stainless steel universal manufacturing. (6x) Clamping Arm 30 mm (bronze press piece) – Clamping Arm 30 mm (1.2 in). Steel finish, chromated. With sliding and pivoting clamping element. Pad 30 mm (1.2 in) with V-pad in steel finish. (4x) Flat Clamp (bronze press piece) – Flat Clamp 305 x 350 mm (13.7 x 13.7 in), chromated, adjustable. For holding flat components tightly in position. Throat depth 200 mm (7.8 in). Max. Clamping height 110 mm (4.3 in). Steel finish, chromated. (3x) Edge Angle Height 70 mm (aluminum) – Right-angle bracket 70 mm (2.7 in). 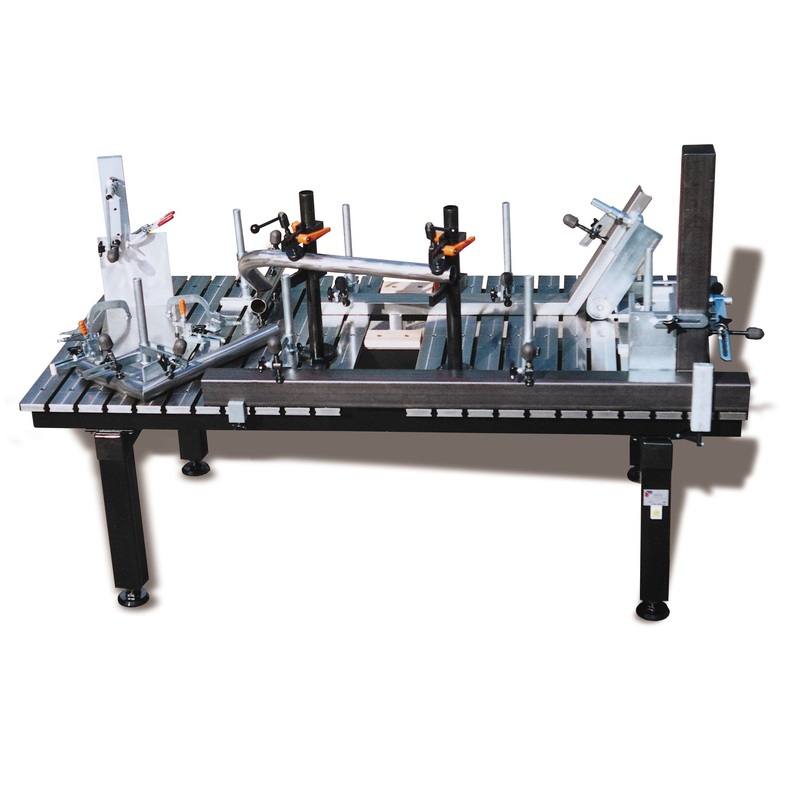 For straight and right-angle positioning of components along the edge of the table. Clamping side slightly chamfered for secure fitting. Chromated, with screw top. (2x) Edge Angle Height 200 mm (aluminum) – Right-angle bracket, 200 mm (7.9 in), for straight and right-angle positioning of components along the edge of the table. Clamping side slightly chamfered for secure fitting. Chromated. With screw stop. (6x) Flat Stop (aluminum) – Flat Stop 170 x 40 x 20 mm (6.7 x 1.6 x 0.8 in). Chromated steel, with locking screw. (1x) Continuously adjustable Angle (aluminum) – Continuously adjustable Angle 350 x 350 mm (13.7 x 13.7 in). Chromated steel, with Allen key and locking screw. 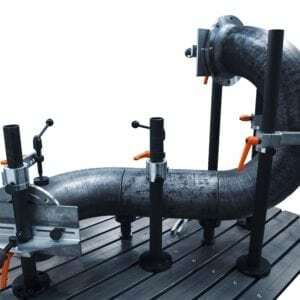 (4x) V-Block Support 60 mm (bronze press piece) – Adjustable V-Block support with steel pad Ã˜ 60 mm (2.3 in). With threaded piece, adjusting screw and T-slot nut. (2x) Clamping Arm 50 mm (bronze press piece) – Clamping arm 50 mm (2 in). Chromated steel, complete with sliding and pivoting clamping element (with steel V-pad 60 mm (2 in).